While exploring the Internet you have probably found a number of sites trying to answer a simple question - "is online gambling legal?" This question is one that has been beaten to death. We are here to provide you with some definitive information surrounding this issue, predominantly by offering the text of some of the laws that have an affect on the online gambling industry. We will not say whether or not online gambling is definitively legal, especially considering it could be illegal in your individual state. In the U.S.A., there are three major laws pertaining to online gambling. One law pertains to online gambling on the whole, while the other two laws that are specifically about sports betting. Even then, one of these laws pertaining to sports betting is solely based on the licensing and creation of sportsbooks in each individual state. We have listed some background to these laws, and we have also included the text of the law on our page. The major law pertaining to online gambling in the United States is the UIGEA, the Unlawful Internet Gambling Enforcement Act. The UIGEA "prohibits gambling businesses from knowingly accepting payments in connection with the participation of another person in a bet or wager that involves the use of the Internet and that is unlawful under any federal or state law." This has effectively made it illegal for gambling sites and payment processors to accept these payments. Though the title of the law makes it sound like online gambling is illegal, it does not. Even state attorneys have admitted that online gambling is not illegal for the players, instead this law has effectively clumped the money laundering into online gambling - once again, this is only for payment processors and gambling sites. "Whoever being engaged in the business of betting or wagering knowingly uses a wire communication for facility for the transmission in interstate or foreign commerce of bets or wagers or information assisting in the placing of bets or wagers or any sporting event or contest, or for the transmission of a wire communication which entitles the recipient to receive money or credit as a result of bets or wagers, or for the information assisting in the placing of bets or wagers, shall be fined under this title or imprisoned not more than two years, or both." Since the Wire Act states wire communication, there has been some confusion over whether or not the laws pertain to the Internet. Though the Internet does use wires to transfer information, it had not been invented when the law was written. The Wire Act has also been ruled to only cover sports gambling and nothing more. Casino games and poker games have not been covered by the Wire Act. The courts have not yet determined whether or not there is a ban on online gambling due to this law. Finally we come to the Professional and Amateur Sports Protection Act of 1992. More commonly referred to as the PASPA, or the Bradley Act, this law was written to determine the legality of wagering on sports in the United States. The PASPA has made it so only a few states in the nation can actually host sports lotteries. Oregon, Delaware, Montana and Nevada are the only states who can license anything closely resembling a sports betting scheme. Nevada has taken full advantage of this, while Delaware has done what they can - three game parlays on NFL games. Oregon and Montana have not regulated any sportsbooks. They are entitled to, but they have not actually used it. Whether or not this means sportsbooks licensed offshore operating in the United States can function legitimately. So, there has little effort to actually ban online gambling in the United States, on a federal level. No arrest has been made due to this, so you will generally not have to worry about being indicted under any of these laws. For the most part, they only pertain to operating a gambling site. This effectively transfers liability away from you as the player. Remember that this is only based on the federal level, as the state's have their own right to determine whether or not online gambling is legal in the state. This is a bit tricky and it all depends on your definition of legal as well as interpretation of the laws. Using offshore sports betting sites are only held back by the Wire Act which as stated earlier prohibits sports betting through wire communication. In other words, if you're not present when making your bet at a regulated sportsbook, it is in violation of this act. However, it is widely debated that this law doesn't apply to the consumer either. Like state laws, the Wire Act primarily targets bookmakers, not the bettors. And even then, unless the betting sites operates on U.S. soil, there really isn't much that can be done about it. Below are our recommendations for sports betting sites that allow Americans to wager. Like the other sites we list, we use these sites ourselves and can attest to their quality. There are other online bookmakers that accept U.S. players that we like as much as BetOnline but they don't accept bettors from all 50 states. We're all about accessibility and that is the reason why BetOnline heads this group of legal US sports betting sites. And, BetOnline is very efficient which is always the mark of a well oiled machine. But, BetOnline didn't get to where it's at now overnight. They built trust with USA players and BetOnline is as discreet as they come. Their reputation for a safe online gaming environment combined with reliable payouts, a 25% to $900 bonus on every deposit, and all the sports you could ever want to wager on makes BetOnline the flagship for legal online sports betting in the U.S. Right now, unless you live in one of the states where online gambling is prohibited (listed to the right) it is not illegal to play online casino games for real money. And, even if you do live in one of those states, the chances of you ever being prosectued is slim to none. The state laws are out to get proprietors and operators of online gambling sites, and traditional gambling establishments for that matter, not the consumers of the product. Below is our online casino that has gotten the best user-reviews and it legally accepts players from all 50 U.S. States. To start, you should know that we trust Lucky Red with our own money when we want to gamble in an online casino. We know that it is safe, and that Lucky Red is very discreet so the only way you could even potentially get into trouble is if you go blabbing all around town about it. 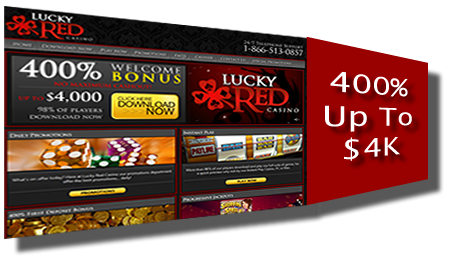 Lucky Red accepts all USA players and even offers an outstanding 400% to $4,000 (LUCKYRED400) welcome bonus for those who want to play slots or a generous 100% to $1,000 (LUCKYRED100) bonus which can be used on most other games. Deposits are easy and legal as Lucky Red uses several reputable third party processors which ensure success. For legal casino gambling that can't be beat, you've got to try Lucky Red. Again, this is a bit tricky to explain but only because there are a lot of misconceptions. The straight up answer is yes, but events like Black Friday have stained the reputation of a lot providers in the industry. The truth is that the poker sites that folded (no pun intended) were really companies you didn't want to do business with in the first place. Money laundering and other charges is what brought these sites down... not providing online poker to players in the United States. Still, a lot of new and previous online poker players are still wary from being burned. For this reason, it is paramount to online recommend poker sites which have reputable backing with a strong foundation in the industry. Because of that, you will not see many sites recommended below but do know that the ones we list are by the books. Bovada - Accepts All U.S. Players Except Those In New York, Nevada, Delaware, New Jersey & Maryland. We don't like teasing you with something that you might not be able to use but with online poker we have to be careful. As we stated above, it comes down to using a reputable company and not the online gambling laws. With that said, we absolutely recommend Bovada. You may not have heard the name yet, but chances are you have heard of Bodog. Well, Bovada is Bodog only rebranded for a North American audience. Bodog was probably the biggest name in all-around online gambling types for U.S. players until Bovada was launched and took it's place. Unfortunately, not all of you will be able to play there... those in New York, Utah, Maryland, and Washington state will need to find another option. But, all other 45 states are welcome to come and play freely. Bovada always has tons of tables running plus tournaments that seem to start hourly or sooner. Plus, their 50% to $250 deposit bonus is another reason to join. We rely on Bovada and you can too... even if you have been burned before. Is Online Gambling Legal In Your State? As of now, no state has actually regulated online gambling (although New Jersey seems to be leading the charge). This has not made it illegal to gamble online, but it does mean that you do not have the faith of the U.S. government or your state governing these gambling sites. Instead, you will be putting your faith in the offshore licensing agencies that cover these gaming sites. In creating this site, we have covered quite a few different gambling sites in order to bring our readers a fair, balanced, and legitimate gaming experience. By covering online poker rooms, online casinos and online sportsbooks, we have brought about the entire industry of gambling. So is online gambling legal in the United States? This is a very involved question, and it is also subject to change. In the end, we highly doubt you will ever get arrested for gambling online.